Q: Is this a real service? A: Yes. 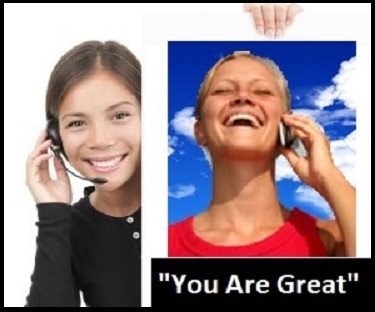 A real person calls and compliments you or a friend. Q: Are the calls long? A: No. They are short (We have a calling service with longer calls for lonely people on the calling service for the lonely page). Q: Is it really free for 7 days? A: Yes. That gives you a chance to try it out with no risk to you. If you don’t love it, just cancel before the 8th day and your credit card will not be billed. Q: Will I be locked into a long term contract? A: No. The service is month to month. Just cancel by the end of the month and you will not be billed for the next month. Q: What exactly does the caller say? Q: Do I deserve to be complimented on a regular basis?